iTeach with iPads: Back to school! New classroom new subject! I am starting the year off in a new classroom and I am now the new Mobile Media AKA ipad teacher! Bulletin board took a lot of thinking, but thankst o all my friends on Pinterest, my room looks amazing. More Pics to come. Best poster in my class was made at http://freepostermaker.com/ for free. 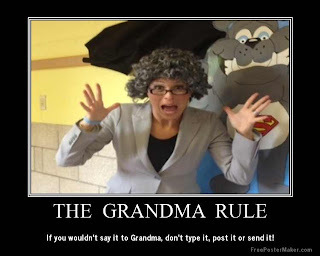 The idea came from a post I saw on Pinterest and the grandma is my principal in a gray wig!